NEW YORK -- Traded to the Yankees after the 2014 season, Didi Gregorius had the unenviable task of following Derek Jeter as New York's new shortstop. "Taking over for who he took over for and being able to have three 20-homer seasons in a row, it's incredible," winning pitcher CC Sabathia said. "If he wouldn't have came in and did what he did the last three or four years, we'd still be talking about Jeet' and how we need leadership." "When I was at second base, he was like, Man, sorry I took that hit," DeShields said. "I said, Nah, bro, you do what you got to do." Sabathia (7-4) struck out seven to win for the first time since July 4. The burly left-hander allowed just one ball out of the infield and lowered his ERA to 3.32 -- the 38-year-old has not finished a season with an ERA lower than 3.38 since 2011. Gray ran into trouble again in the eighth, allowing the first two batters to reach, but Jonathan Holder wiggled out of the jam with a pair of strikeouts. Expected to be a key component of New York's rotation, Gray has given up nine earned runs over his last 5 2/3 innings since being moved to the bullpen. 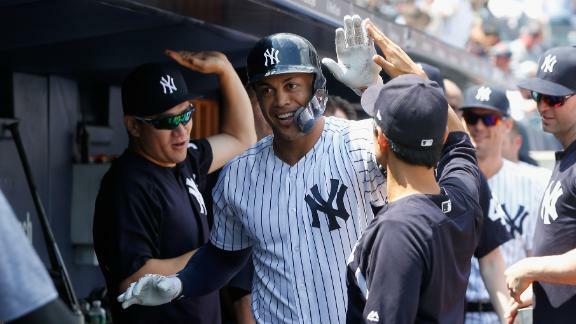 Giancarlo Stanton takes Martin Perez deep to put the Yankees on the board against the Rangers in the first inning.